I read this article and found it very interesting, thought it might be something for you. The article is called The More Trap and is located at https://www.ben-johnston.co.uk/the-more-trap/. As SEO’s, particularly agency-side, we’re conditioned to think of “more”. Our clients need more links, more content, more reports, more meetings, we need more tools, more time, more budget, more links, more everything. I’ve been thinking about this a lot lately, particularly around the way my role and my approach to SEO have evolved over the last few years, and I wanted to put some of this down. Hopefully you’ll get something out of it too. A big part of the problem I see with this industry is that we’re conditioned to think of scalability, of doing everything bigger. We cut costs to win clients, but then their budgets don’t quite cover what we need to do to get the results that someone promised in the sales meeting, so we have to find ways around it. This is probably a big factor in why we have hammered so many easy tactics into the ground over the years, why outsourcing has become so prevalent, why link removals have become such a big factor in current campaigns. More means, in some cases, we’re not thinking of the future, we just care about getting the job done now. What if we changed that? There are questions of scale in everything, I’m just wondering if the industry scales the right things. I suppose this is something of a follow-on to my post about the Link Economy; that question of us scaling links to the point where, rather than do the work properly, we’ve got SEO’s paying someone on the other side of the world $15 to drop 100 directory links with five different anchor texts. What if the industry didn’t spend that money and, instead of spending our time on trying to find other ways to game the algorithm and build that same number of crappy links, we spent the time on creating something, on building a few, high quality, relevant links that send traffic and helped in the SERPS as well. Can the SEO industry as a whole be reconditioned to think less about “more” and more about “better”? I’m not sure, but if you’re a client or business owner that’s about to take out an SEO contract, that change starts with you. If you’re a client of an SEO agency – any SEO agency – I’d like to ask something of you. I’d like to ask you to think about why you’re doing this. Why do you really want page one rankings? It’s to send more traffic, right? With rankings being an increasingly unreliable metric, what if you worried less about them and more about the real reasons you’re on the web – making money and building brand advocacy? Do you need more of an unreliable metric or do you need more of the kind of thing that translates into your bottom line? Traffic, conversions, trust and visibility are much better things to focus on. Do you need more meetings? If you’re honest with yourself, probably not. Meetings are great, but if you think about it, you’ll probably realise that not much gets resolved or planned in a meeting. You have fun talking with your agency or staff, you maybe go for a spot of lunch but, in all likelihood, the results and actions from this meeting could be achieved in less time and effort through a Skype chat, email, Google + Hangout or even just a phone call. If the time you’re paying for is used efficiently and the trust between you and your agency is there, you’ll get more work for your money. It really is that simple. Trust your agency, educate yourself and you’ll get more of what you need. It might not be more of what you thought you needed at the start but if your agency are doing the right kind of work, you’ll (hopefully) make more money, which is why you’re doing this in the first place, right? I’m as guilty of these things as you are. I’ve spent countless hours working on getting more links for my clients, writing more content, doing more in PowerPoint and an ever-increasing amount of reporting over the years. I’ve begged for more staff in my team, I’ve spent money out of my own pocket on more tools, I’ve spent way more hours in the office and working at home than anyone should ever have to do. You know what these experiences have taught me? 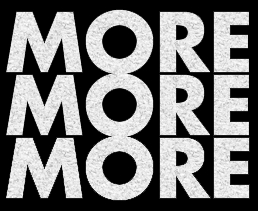 More is never enough. Don’t spend your time or budget on more if you don’t actually need it. Review your tools regularly, try to find other ways of using them, use Google Docs for anything you can. Worry less about scaling generic links, invest the time in creating things that scale. One piece of great, innovative content can often create those links that you need and it’s easier to get the links you need when you’ve got something to work with. Ultimately, I suppose I’m saying that good work scales a lot easier than just doing more. Educate your clients; work with them to understand that more isn’t always better. By doing better work and educating our clients about why we’re doing these things, we can hopefully all escape from the more trap. I’m on my way to that. It’s a long process, especially when it comes to breaking the association of SEO only being about rankings, but I’m getting there. Are you still focused on more or do your clients understand the benefits of better? I’d love to hear from you in my shiny new Disqus comments section or on Twitter. If you enjoyed this post, sign up for FREE updates to stay in the loop. Copyright: Ben Johnston. Built With The Genesis Framework.